If you are an English teacher, a writing professor or simply an enthusiast of the English language, you may cringe when you see or hear someone grossly misuse the language. Professor Paul Brians, Emeritus Professor of English at Washington State University, accumulated one of the most impressive and comprehensive lists of common errors in English usage. 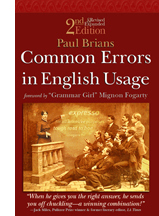 The extensive online database is actually based upon Paul Brians' popular publication, Common Errors in English Usage. 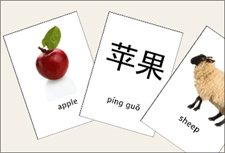 The book is written from the perspective of an American English professor, so the usage concepts contained therein are built upon what is called "standard use" of English. These are the agreed-upon rules that English teachers, professors, literate executives and professional writers all agree constitute proper usage of the English language. When you arrive at the main page of Paul Brians' website, you'll see a link to "Go to list of errors." When you click on this link, you'll find yourself whisked away to the main page of his database search engine. This is where you can dig through the mountain of English usage examples, which you can then use to improve and enhance your own writing (and speaking) abilities. From this point, if you scroll down just a little bit, you'll see the reason this website is one of the most popular online resources for teachers and students of the English language. From the main search page, you'll discover three methods that you can use to search through the database of common errors. The first is by using the built-in Google custom search engine. When you search using this search field, the results all come from the wsu.edu site. Make sure that only "Common Errors in English" is selected, or you'll also get listings from throughout the Internet. For example, searching for the word "alterior" turns up the alterior explanation page from Brians' list of errors. If you know what letter the word you're looking for starts with, just click on the letter link at the very top of the list. This will automatically scroll the screen down to the section of the list where words starting with that letter are organized. You'll notice that each group of words starting with that letter is listed in an area with the starting letter printed in large font to the right. This also makes it very easy to quickly scroll down the list and see how each group of words is organized. A third and final approach to making the most out of this site is simply scrolling down and browsing through the list. Sometimes, this is the most informative approach, because you may discover interesting terms or an incorrect usage that you never knew about. This list includes hundreds of examples of incorrect grammar usage. By studying this list a little bit every day, you could learn about as much as if you took an entire grammar class. When you click on any of the terms, you'll see the explanation. Each explanation has an icon image and a descriptive title, a pencil header line and then the explanation underneath. All of these explanations are well-written, simple and always very informative. You'll feel as though you are sitting in a grammar class and receiving instruction from a very informed and intelligent professor. If you've gone through the list of common english errors, and you can't quite get enough, then scroll down to the very bottom of the web page and you'll discover another treasure trove of English grammar information. Under the heading "Supplementary Pages," you'll discover additional information that's just as useful and interesting as the list of grammar errors above it. Grammar Non-Errors - Some common grammar error myths. The English language is, by its very nature, sometimes a bit backwards and confusing. Often, a single word can have one meaning within one context, and then an entirely different meaning in another. There are similar spellings, figures-of-speech and many other usage concerns that can be difficult for English students to grasp. A website like Paul Brians' list of common errors in English usage serves as a very useful learning tool for those students, and for teachers and professors who teach the English language. Thanks for the comment Paul! I appreciate the kind words - and thank you for the insight regarding the text-version. I would definitely recommend to readers that they purchase the book for a quick/easy offline reference no matter where they are. Thanks a lot for the great review. This explains the site better than anyone else ever has. However, if you are going to read straight through the whole site, it is easiest to use the text-only version. It lacks italics, curled quotation marks, and other niceties; but it's one very long page you can read through much more efficiently than clicking on each entry in turn. Or of course you could buy the book and just settle in for a nice long read. The book has numerous illustrative cartoons which are not part of the Web site.